On the store's website, you must show the payment form with the order data (in some cases, you can also show the form in the catalog of products and services on the Yandex.Money website). The user's preferred payment methods are first (if the user has already made a payment in this store or using Yandex.Checkout). By popularity (based on Yandex.Checkout statistics). According to the store's settings (you can configure this yourself). The order for showing the payment methods is at the merchant's discretion, and dynamic ranking is not available. New payment methods are added automatically. Any new payment methods are added to the payment form by the store. This scenario will work if the store uses 3 or more payment methods. The user chooses the payment method and goes to the confirmation page in the Yandex.Checkout service. If necessary, the user enters additional information and confirms the payment. Here is an example of what the process looks like for a user paying with a bank card. The user clicks the payment button (such as Pay in Yandex.Money) on your website. The user goes to the Yandex.Checkout webpage and sees three payment options. If this user has previously paid for something in your store or using Yandex.Checkout, the user's preferred payment methods are shown. This might be the user's bank card, Yandex.Money Wallet, or internet banking service. Other payment methods are available in a popup window. The user chooses a bank card that was used previously, and confirms the payment with passwords. When the bank has verified the payment, money is deducted from the card, and the user sees a page with payment information. The user chooses the bank card payment method on your website. The user then sees the page for entering information in Yandex.Checkout. During the payment process, the bank may request additional security (3-D Secure). In this case, the user confirms the payment with a special password. The page where the user enters the card information and confirms the payment belongs to Yandex.Checkout and is protected using the PCI DSS standard. If the user chooses a different payment method, the payment scenario is slightly different. You can download instructions on the Yandex.Checkout website. These instructions describe all the available payment methods in detail. 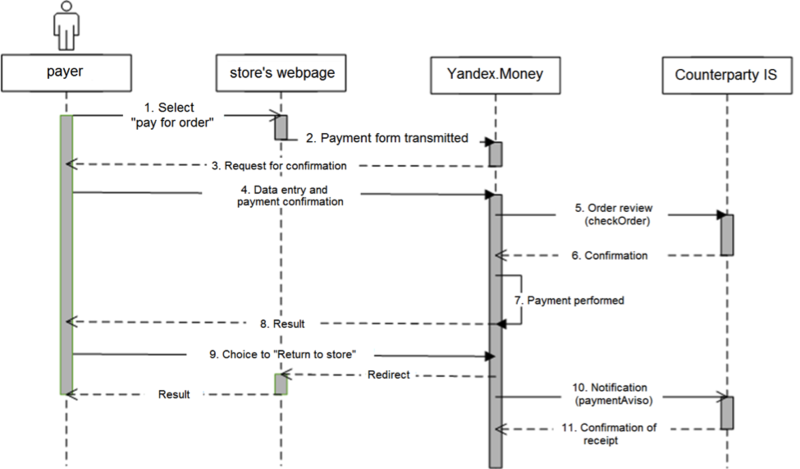 When choosing the payment method in Yandex.Checkout — in an interactive presentation. When choosing the payment method on the store's website — in the demo store. The main scenario is a payment using a Yandex.Money Wallet or a bank card. The flows for payments with cash, using external payment services (online banks and so on), or using a mobile terminal are described separately. They differ slightly from the main payment scenario. The user selects the payment method (on the store's website or in Yandex.Checkout) and clicks Pay. The information that the user enters in the store's interface is transmitted to Yandex.Checkout. The user ends up on the Yandex.Checkout payment data for the payment method and parameters they selected. The user enters additional information (i.e. logs in to their wallet or enters bank card data). Yandex.Checkout sends an Order verification request to the store's information system. Yandex.Checkout sends the user a payment confirmation request. For wallet payments, the user must enter an SMS code; for bank card payments the user is sent to a 3-D Secure authentication page (if the issuing bank supports it). The user confirms payment (enters the SMS code or passes the 3-D Secure authentication process). If the merchant responds positively to the Order verification request, the money is debited. The user sees the result — a page with a message about successful payment, or a page with an error message. After successful payment, the merchant gets a Payment notification request. If the merchant responds positively to the Payment notification request, the payment is considered successful. When a store gets the Order verification request, the order has not been paid yet. The user might not confirm the payment. Steps 1 through 4 and 7 are the same as when working with the HTTP protocol. Steps 5 and 6 are omitted. 8. The money is debited. Steps 9 and 10 are the same as when working with the HTTP protocol. 10. After successful payment, you receive an email notification of payment.